Your health and wellbeing is a priority. How will you ever do your thing running on empty? If you feel drained and fragile, red jasper can help you get your strength back and life force flowing. These Native Healing Red Jasper Heart Keychains are an ideal tool for anyone trying to stay spiritually connected and aligned while on the go. Have a few moments to meditate in the car? You’ve got a beautiful, heart-shaped red jasper carving right there with you. Hold it in your hands as you shut out the world and journey within, even for five precious minutes. The energy of red jasper radiates like a breath of fresh air. Restorative, calming, strengthening. A go-to healing stone in the Native American tradition, this stone will help you find your groove and your flow with greater emotional ease and fortitude. Its stunning, deep red coloring and swirling pigment remind me of the blood flowing within our veins; the warm life pumping through our bodies. Red jasper is a stone of regeneration. It brings renewed strength and courage, working with your physical body to ground and connect you with the Earth while creating both stability and emotional cadence in your life. In order to soar to new heights in any endeavor, we must first be firmly planted, strong, and fearless. 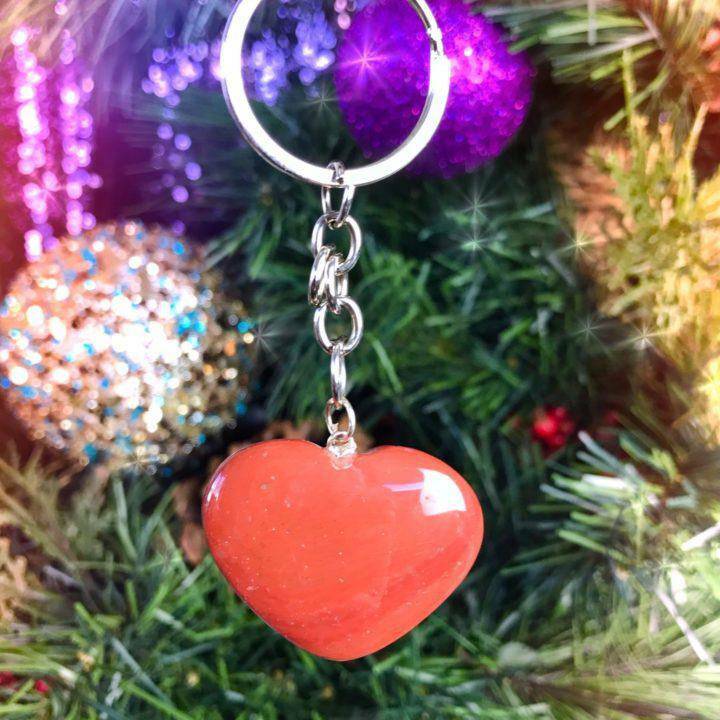 In the shape of a heart, these keychains are powerful tools in the realm of love. To work with yours, hold it in meditation. Close your eyes and draw inward, envisioning pure healing light surrounding you, infusing you with vitality and the embrace of Mother Earth. Feel yourself releasing low and stagnant energies, making way for positivity to flow through. Feel your body, mind, and spirit realigning with ease, in the wisdom of your Highest Self. Use these Native Healing Red Jasper Heart Keychains to gain a grounded sense of bravery, filling you with the resilience to boldly go where you’ve never gone before. This listing is for one (1) Native Healing Red Jasper Heart Keychain (the stone is about 1.25” in size). Yours will arrive lovingly parceled, along with a single leaf of white sage and a card describing the properties of the stone.